A trip to Mexico normally connotes beaches, big-game fishing or climbing archeological ruins. But before heading to the Pacific or Caribbean on either side of this vastly diverse country, consider an excursion inland to the lesser-known state of Morelos in the south- central part of the country. 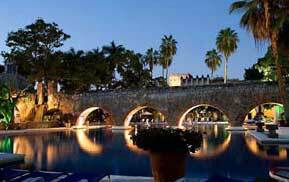 Though small, Morelos and its capital, Cuernavaca, are resplendent with culture, beauty and colorful history. Such figures as Spanish Conquistador Hernán Cortés and Revolutionary Emiliano Zapata lived there, leaving an indelible mark on the landscape — literally. Cortés arrived in the 1520s and immediately went about subjugating the local Indians. After ten years of ravaging much of Mexico, he chose Cuernavaca to live out the rest of his life because of the mild climate, and he built an impressive palace there. Incidentally, Cuernavaca is known as “the city of eternal spring,” boasting annual average daily temperatures of 70 degrees and lush vegetation. Cortés ordered haciendas — large land estates with mansions — to be built surrounding Cuernavaca, and appointed Spanish Lords to run them, often mercilessly over the natives. In their heyday, each hacienda was a rural, autonomous social unit. The haciendas in Morelos became some of the world’s most important sugar plantations of the 16th and 17th centuries. The Mexican Revolution of 1910 – 1920 proved the downfall of the haciendas. Zapata and his followers roamed the country, burning and pillaging every hacienda in sight, eventually restoring land and rights to the people. These venerable structures conjure up surreal images of ruined palaces, but still possess a faded grandeur. The haciendas are mysterious, yet magical, and many have been restored and turned into magnificent resorts today. Exploring the old haciendas is like stepping into another world. Walking the grounds is an adventure in architecture and a veritable feast for the eyes. Strolling palm tree-lined paths, past purple jacarandas, shock-orange tabachines trees, and fluorescent fuchsia bougainvillea, you’ll find fountains, sculpted gardens, stunning pools ringed by centuries-old columns and aqueducts, talavera-tiled patios, secluded terraces, and walls overgrown with vegetation. 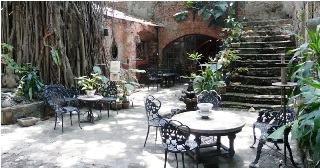 Each hacienda is unique, with artifacts from the time period incorporated into the décor. 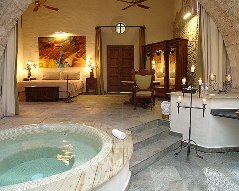 Each room is unique with an eclectic blend of modern and old Mexico. All the haciendas offer recreational activities, such as tennis, swimming, horseback riding and golf, with luxurious spas. Divine cuisine from their award-winning restaurants is a major attraction. Some of the tastier offerings include: apple-cilantro soup, pumpkin-black bean soup, pink mole, mango crepes and mamey crème brulée (mamey being an indigenous fruit). Weddings, receptions and conventions are mainstays of the haciendas’ business today. Every hacienda includes a chapel on its grounds due to Jesuit and Franciscan missionaries sent from Spain, who played a key role in the brutal expropriation of lands from the Indians. One hacienda entices visitors with the invitation, “Un Mundo Aparte.” Truly, a visit to any one of these haciendas is “a world apart” — a place that plunges one into the grandiose past of Colonial Mexico and revives the energies of all who stay within their walls. All are located within a 30 minutes’ drive of Cuernavaca and 90 minutes from the México City International Airport.